Christopher's mornings continued prosaic. He now took over from Paul the job of sweeping the ashram paths with a leaf broom. Apart from Irish Swami's enclosed garden, the borders around the trees and the neat rows of bushes clipped by Irish Swami himself, the rest of the ashram grounds were sand. On the first morning the Swami showed him. On the second Paul helped him. On the third he was left to himself. It had to be done before breakfast, so he swept the leaves together as quickly as possible, leveled the sand before Irish Swami's gate and the dining-hall where it was most likely to be noticed, washed his hands at the tap and went into breakfast. Faith his stomach full and heavy he stood in front of the dining room while Irish Swami pointed silently at fallen leaves. They looked familiar, yet Christopher was sure that he had swept all the paths quite clear to avoid this sort of situation. "I thought I'd got them all," he muttered. "Perhaps they fell during breakfast." "Balderdash. Can't you see they've been trodden on?" Christopher swept again. Some of the leaves were half imbedded and would not be caught by the broom. He looked up for instructions. "What's the matter? Are you paralyzed? Pick 'em up with your hands." This had never occurred to Christopher. Sweeping was sweeping. But he picked leaves up one by one and crept over the disturbed patches. He was tired and his shirt clung to him. It had taken him more than one hour and a half. Next morning he got up as soon as the scripture-prescribed gargling and hawking at the well woke him. The shoemaker had finished his sandals yesterday. He wore these and his new shorts. He worked bare-chested. He swept and swept until he was dazzled by the order of the garden. He picked up every single leaf and even plucked the drying ones from low branches, bushes and flowers in case they should betray him before Irish Swami's emergence. He was shaking a branch when the Swami appeared on his verandah in a loincloth. "How's that?" called out Christopher. "What's first?" He was always saying what's that. "Size eleven or ten and a half, I would my." The imprints of his sandals were all over the ashram, showing every tortured pigeon-toed and splay-footed stance he had taken to get the mind clear. There were even half-soles where he had tiptoed guiltily past the Swami's private enclosure. "You didn't sweep ahead of you. You had to back away from your own footprints so that you could sweep over them." Irish Swami showed him the crab-like sideways backing. "Any villager can show you. You see, you won't believe there's only one way. Your ego refuses to believe. Time enough to start experimenting and being creative when you've learnt the right way. There's a reason for it. There's a reason for everything, I tell you." He came down from the verandah and grabbed the broom. "Now watch." He set to work with wide rhythmical sweeps, one hand resting on his bent back. The footprints went and in their place appeared a design of semi-circles. Every ten steps the sweeps were inverted so that an orderly geometric pattern grew up the path. "There. If you want to leave your stamp on the sand that's the way to do it." He balanced the broom delicately on his palm. "The spiritual path is skill in action." He sang out his motto to the tune of Danny Boy in a lyric Irish tenor. "The path of the spirit," he added to the next bars, "is skill in the sand." He thrust the broom back and went into his house singing. Christopher recoiled fastidiously every time his ego was brought into these purely manual operations, but the Swami's working demonstrations left him defenseless. He was going to have to stay long enough to outdo him after all. He began erasing the remaining prints. In his head he was working out original designs. Their execution would have required a setsquare and a pair of dividers. The first half of the day was a formal drill whether his sergeant-major was there or not. When he wasn't Christopher always expected an ambush or an unannounced barefoot approach. Irish Swami walked as noiselessly as a tracker. He would suddenly be there, at the well, behind Christopher's sweeping arm; in the room while he rifled an untidy case for clean clothes; behind him when he typed letters for Joan, Raoul (these he never posted) or his mother. "Iru, iru... summa iru." It was a constant admonition, take it vary, crooned, hissed or bellowed in his ear according to Irish Swami's mood or Christopher's degree of excitation. At times he would simply thrust his tattooed arm under Christopher's nose, grin and walk out. Irish Swami was there. Coming out of the latrine Christopher encountered him. "How did it go?" In the morning at the side of the mat: "How did you sleep? You haven't got that leg right yet. You turn it in, like this." He was there when he wasn't, knowing how Christopher had slept from a look at his face, whether he had smoked from a sniff at his room three hours later, what he had bought at the stalls from the gossips at the temple. Christopher watched his own movements, his thoughts. He learnt to do without toilet paper, used his left hand to wash, and sprinkled lime in the spotless latrine. He used forty buckets and did without soap. The tradition said that soap defiled. Extra grease and dirt could be massaged away, the natural oils retained. He even learned to keep a tidy plate and his suitcase ready for inspection. It must have been the afternoon that made the rest of the dogged, slogging day worthwhile. At three Christopher walked to Irish Swami's compound for coffee, which neither Paul nor Ramesh drank. The Irishman was as addicted to coffee ("Shouldn't be but I am") as Christopher had been to alcohol. It released his vocabulary and sharpened his memory. It switched off much of the guru and sent the conversationalist bounding out. He became the historian of his life, of India, of the world. His studies in religion and archaeology allowed him to deal with civilisations like a Cartier expert dismissing flawed gems. "The Greeks. The Greeks. Well, what about them? That's all we know in the west. The beginning of everything," compassionately. "The Greeks were the tint to lionise and barbarise culture. They only started the process for us but they did a good job. Turned it into a cult, disintegrated it with their man-centred humanism. Able fellows, the Greeks. They gave it a noble twist. When the Babylonians got comfort-bound and scent to the dogs everybody could see what happened. The Greeks had it both ways, made it a gimmick... science, liberalism, got to know how we're thinking, you know, even if the premise is a piece of dung. All educated westerners are superior to primitive Indian villagers, therefore we are superior." "That's yours, Christopher. Aristotelians would reel before the categories in logic that any second-rate pundit has at his fingertips. The occident is still hamstrung by the Greeks. At Oxford they're actually going backwards. They've started analyzing the first word of the premise. What does all mean before we can go any further? Mathematical logic has to end up like higher mathematics, knowing it knows nothing. They never made that mistake here. They analyzed and mathematised as much as anybody, but they always knew that to know the world you have to become the world. That's why they don't disturb knowledge by applying it. You have to be Brahma. To know the moon you don't go to the moon and have a look around. Be the moon." He shook a finger at Christopher. "Be the moon, you understand. Otherwise you know nothing about it. Once you've done that you may come back with some interesting facts about it. Then the monkeys in America and Russia will start applying them. Be the moon. Be the star. Be the.. ."
"But how?" pleaded Christopher. The man was no less potty in the afternoon, but when he divulged Christopher became subject to the disease. "How? But how?" mimicked Irish Swami. "Typical western question. No humility. Got to have a method. Gimme, gimme. No humility. No patience. We won't sit down and wait and learn and listen." Then came the silent private shake of laughter. Christopher mistrusted the vituperative attacks on the west. "You identify with it, of course. Simply be," said Irish Swami quietly at the end of his merriment. "Come on. Time for the temple." The vicious way Irish Swami spoke of departed disciples was suspect too. The fanatical cleanliness. The preoccupation with order. Christopher had misgivings about them all, but caught in a cataract of words he would find his criticisms and reservations unjust. From any point of view his knowledge was elementary compared to the Irishman's erudition. His range and flow turned Christopher's much-admired tales into crummy little vignettes. He was a stale anecdotist listening to a master extemporizing. Irish Swami might be deranged, but there was nothing spurious about his conversation. It never wandered. He was genuinely possessed when he talked. 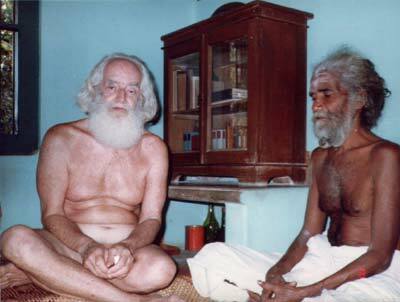 German Swami Gauribala with Mayilvahanam Swami of Ananda Ashram, Selvasannidhi Murugan Kovil, Jaffna, in 1981. At the temple he settled down and pointed things out for Christopher, the humorous as well as the serious, but when Christopher asked obliquely why the priests looked better fed than the other villagers. "Ah that's what we always want to know, isn't it? Where does the money go? But the villagers don't want to know. They give. 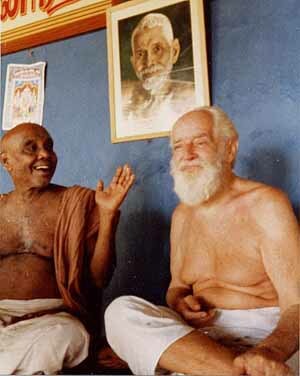 They know that all money goes to Bhagavan in the end. Of course a little sticks to the priests. Why not? This isn't a parish church. No books to balance, you know." Always an answer. It became a private hobby: to find the point that didn't have an answer. But while he was looking, observing, trying to find a weak kingpin, he sat still. He never gave the tattooed arm occasion to shoot out over the coffee lectures or in the temple courtyard. But he questioned. "Balderdash," returned Irish Swami when he couldn't be bothered to answer a question. "But what's the good of the mind if you can't use it?" exploded Christopher. "The mind has its uses." Every word was accentuated, and Christopher waited for the Swami to contradict himself once again. He didn't. "The mind is there to be enlightened. Once it is it can organise what it has received. Until that happens you're living in the ignorance." And since it was settled that Christopher was a man living in the ignorance, not surprisingly he did and said nothing right. When he hit on something that was not wrong it was for the wrong reason. "Nice morning," he said one day when Irish Swami came to the verandah to watch him sweep. "Balderdash. You say it's a nice morning because you think it's a nice morning. You're recording your impression for what it's worth, that's all. As long as you know that you won't do much harm. Trouble is you don't." It was a normal way to start the day, and before Christopher's anger could explode he would remind himself that he was living in a madman's house. This soothed but did not entirely convince him. The paths were too straight, the cement mixed by those red-haired hands too fine and smooth, the houses built by the same hands too neat and well maintained. There was too much order to dismiss it all with such a charge. This was no Hansel and Gretel marzipan cottage. True that Paul and Ramesh prostrated to him morning and evening, but they liked it. Everybody in the village seemed to like it. It was the custom to bow to the guru. Christopher had swept the paths meticulously every day. His beer-belly was melting, he could swing forty buckets up without panting. . . well, hardly at all.. . maybe thirty. He was gaining confidence. One morning, after the first balderdash, he laid his broom quietly beside a little mound of swept leaves and looked up at the crazy one on his verandah. "Look, I can't take it any more. Haven't we who live in the ignorance any right to a little peace?" Irish Swami pointed at the gate. "You know how to open it." He could be as miserly with words as he was extravagant. Christopher looked at the gate. He knew how. He didn't want to. He didn't know where to go. He told himself he had a score to settle but didn't know if this was true. He picked up his broom in silence. "You know, that's typical socialist jargon, Christopher. Haven't we a right?" Irish Swami ruminated the words and did some stretching exercises while Christopher swept, his left arm in the required position on his back, but clenched. The man could never leave a thing alone. "Those living in the ignorance never get any peace." He stopped his exercises to do his secret mirth-quake. "That's why you're always getting annoyed with me. Ignorance. Otherwise it wouldn't touch you. You get annoyed with yourself mostly, you know." "Let's see," and Irish Swami pointed out that Christopher hadn't burnt the leaves for days, that he had swept them into a mound to avoid work. "I swept them there for the last three days because I intend burning them at the end of every week." Christopher stated this truth with dignity but he was annoyed with himself because he knew very well that the minutest deviations meant trouble. "Every week! In a week's time the leaves will be moulding. The nature of the sand will have changed. You'll have trouble burning it. You'll make a mess and a stink." The explanation was given patiently. "That's what happens when you try to make things easy. One day you'll believe my way is the easy way." It was, for the Irishman. Life was easy for him. He was at the top and he did everything without difficulty. Paul and Ramesh obeyed unquestioning because they also believed that there was only one way to do things. The first time Christopher took the initiative in trying to do it the ashram-way he ran into a problem. He was tired of walking from the well to the ashram in damp underpants and having to take his shorts off then and each time he went to the latrine. You couldn't fling water at yourself with your shorts around your knees. The others only had to gird their cotton up at the waist. He had hoped the Swami would for once use his prerogative usefully to tell him to wear the traditional and suitable clothes. When he suggested it himself Irish Swami wagged his head in the usual non-committal agreement. There were several major obstacles. First Christopher had to get rid of all his other clothes. Secondly, if he was going to dress like the others he would be regarded by the whole village as a disciple and it would mean he would have to obey the guru's instructions. "What am I doing now?" asked Christopher in shock. "You don't know anything about the guru-disciple relationship. It takes the westerner between eight and twenty years to surrender to the guru." "Ten," snapped Irish Swami. "And I was trying." Thirdly, Christopher was to hand over the whole of his army pension and take whatever was given for pocket money or nothing at all. "The ego doesn't like it." Christopher didn't like it either, but it had to be considered. It was impossible to live in these clothes; besides, he had gone so far already. What could he lose? And there was nothing to spend his money on. "Does the gate stay open?" "The gate is always open. You walk out on your two bare feet." Then Irish Swami laughed loudly and pounded the floor with his hand in amusement. "You can always count on it. The first thing the ego does is to look for the escape hatch," by way of explaining the amusement. "It thinks if it goes from here to there," pointing at the gate, "it's free. That's what I call living ignorance." That's what I call hysteria, thought Christopher.